Plasma might be enjoying something of a renaissance thanks to its skill with 3D, but that applies solely to higher-end sets. Down at the 50PJ350's level, it's all about price. 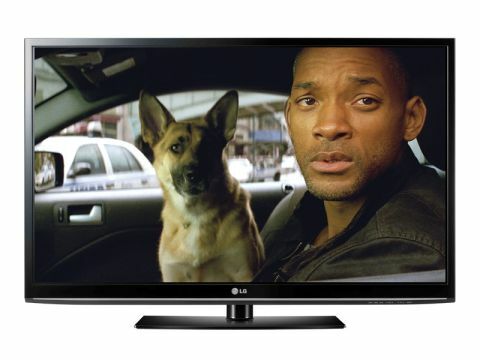 That LG has created a 50-inch plasma – for so long a high-end proposition – for under £500 is a giddying achievement. With no Freeview HD tuner and saddled with an HD ready resolution, when full HD is now expected by most buyers, the 50PJ350 looks dated. However, it's a fair bet that the sort of buyer that doesn't care too much for the latest spec is probably more interested in size and looks and this gas giant is a stunner. It's only 55mm deep and the frame around the display just 30mm wide, which increases the perceived size of the screen to an impressive degree. Scratch the slinky surface and this basic bigscreen is a reasonably advanced plasma performer. LG's icon-based interface is easily the best in the business and makes the 50PJ350 a pleasure to use. The aforementioned lack of Freeview HD is a surprise and the 720p resolution means that Blu-ray can't be displayed to maximum effect, which might seriously hamstring the 50PJ350's appeal, but remember that plenty of also non-3D, 50-inch plasmas just like this one sell for more than double the price. Initial set-up is a cinch, with the 50PJ350 tuning in all Freeview channels in under a minute. Two hours of schedules for six channels are presented simultaneously on the nuanced electronic programme guide, and though the combo of blue and grey shades on LG TVs is usually pleasing, the EPG here would profit from decreasing its over-large font size in order to display a lot more information. A Picture Wizard guides you through a simple set-up session and as well as the usual sports, games and movies presets, there are two empty markers for ISF (Imaging Science Foundation) calibrations. They provide advanced 'expert' controls covering everything from vertical and horizontal sharpness to colour gamut, temperature and even tweaks to RGB brightness and colour. However nice it is to see these options, serious home cinema aficionados ought to be looking solely at 1080p screens. Exit the menus and it will remember where you left off and find it again. That's especially useful, since it's very easy to do just that by accident when using the rather sensitive remote control. The onscreen menus themselves shift around the screen slightly to avoid any image retention. One disappointment is USB playback; the media player happily gobbles MP3 and JPEG files, but doesn't handle any video files whatsoever. Plasmas don't suffer from motion blur anywhere near as badly as LCD TVs and don't need the same 100Hz processing to speed them up. However, as if to underline how innately quicker plasma tech is, a 600Hz mode is advertised. However, a rather weak frame insertion feature called Film Mode doesn't remove what blur and judder does crop up. Colours are reasonably nuanced and contrast-rich, while not quite up to the level found in plasmas from Panasonic, is streets ahead of the LED competition. In a side-by-side comparison with a smaller LED TV, the 50PJ350 suffers from a lot less resolution loss, a more fluid movement and deeper contrast that enables it to render a lot more shadow detail. Cinematic it may be, but the picture is clearly not as sharp as a full HD LED screen; individual pixels are visible from about five feet away. The upside of that relatively soft image is that lower quality sources – such as Freeview and DVDs – are highly watchable even stretched to this enormous size, though colours aren't as tightly rendered. Boasting wide stereo effects, traces of low frequency sound, the 50PJ350's sheer size lends it more audio clout than most TVs. It's particularly good with music – relatively speaking – with presets also provided for cinema, sports and games. Clear Voice II is also present (you can even set the level), though dialogue clarity is not an issue. An Infinite Sound mode can be selected while another preset is in full flow, offering slightly more power (and an occasional touch of distortion). A tiny audio delay is sometimes discernible, resulting in some lip-sync issues when feeding audio and video from a Blu-ray player via the side-mounted HDMI input. Precisely how enticing this £500, 50-inch plasma is will very much depend on what it is that you're looking for from a TV. If the wow-factor of 3D and hi-resolution, full HD pictures are near the top of your list of demands, you'll find little to excite you here. Colours and contrast, while decent compared to budget LCDs, come nowhere near the highs usually provided by plasma and the features are rather thin on the ground. Having said all that, £500 is still a ridiculously low amount of cash to shell out for a 50-inch screen, making this a tempting option for those that want big pictures that won't break the bank.